Azerbaijani jazzmen got together to show the beauty of jazz music on October 26. 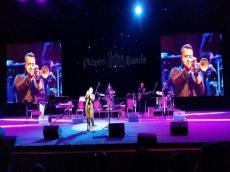 A wonderful gala concert took place in the Heydar Aliyev Palace, one of the best live music venue in Baku. Mirjavad Jafarov, ensemble "Jangi", honored artist Shirzad Fataliev (wind), laureates of international competitions Arslan Novrasli (tar), Shakhriyar Imanov (tar), quartets Elvina Bashirov, Nijat Aslanova and Afshina Alizade entertained listeners with a high-energy concert. Musicians brilliantly performed top jazz songs that have been popular with the listeners. Addressing the event , TV presenter and jazz expert Rahib Azeri told about the history of world jazz and its development in Azerbaijan. He stressed that the history of Azerbaijani jazz originates from the 1930s. The first jazz orchestra in Baku was created in 1938 by prominent national composers Niyazi and Tofik Guliyev and others. Thus, Azerbaijan State Symphony Orchestra laid the foundation of jazz music in Azerbaijan. The revival of jazz in the Land of Fire started in 1960s, thanks to the creativity of Vagif Mustafazade, Tofig Ahmedov, Rafig Babayev and the quartet "Gaya". The first jazz festival in Baku was held in 1969. Baku International Jazz Festival is held annually, bringing together world-class jazz musicians. Today, national jazzmen are the winners of many international jazz festivals and competitions. Azerbaijani jazz masterly combines New Orleans rhythm and musical traditions of the East. The music genre continues to fascinate music fans around the world.